. يعمل George Powlett Apartments على ضمان إقامة مريحة لضيوفه من خلال خدماته الممتازة وحسن ضيافته. يقدم هذا الفندق العديد من الخدمات الكفيلة بإرضاء أكثر الضيوف تطلباً. يمكن للنزلاء الاختيار من ضمن مجموعة من الغرف المصممة بعناية لتعكس جواً من الراحة، والتي يتجاوز عددها 45. إن حديقة هو المكان الأمثل في الفندق للاسترخاء وتفريغ طاقتك بعد نهار طويل. اكتشف مزيجاً ساحراً من الخدمة الاحترافية والخيارات الواسعة من وسائل الراحة والمتعة في George Powlett Apartments. Request for early check in and been well assisted by the receptionist. Request late check in for 2nd stay and suit case has already put in the room around 5pm. A nice view with a small balcony facing the street. The path to go in the parking area very tiny, only for small cars to enter. We really enjoyed the accommodation provided and the hospitality afforded to us during our stay in Melbourne. At the best hotel rates! Just a bit of comment. House keeping could be improved a tad. But otherwise a winner here. Will come back to stay when we visit again. Thank you so much. Pretty easy to find, about two blocks walk to city, easy walk. Right beside fitzroy gardens. Quite area, easy check in and check out. Room had cutlery, microwave, fridge, air and tv. Internet was included. Parking was available, easy walk to river as well. Good value for motel close to city with parking and internet. I've booked a room in that hotel because it was the only one I could find which had an en-suite bathroom, free Wi-Fi and was somehow affordable. The room was large and clean and there was even a small kitchen. Nevertheless I paid less in other Australian cities. My stay with the apartment was great. I enjoyed myself very much. Their daily room service was wonderful, I got fresh clean towels everyday. The apartment was newly renovated so there is no foul smell at all. I booked first, looked a reviews afterwards and thought I'd made a bad mistake. But from my first encounter with the receptionist I realised that the previous reviews were outdated, unfair or both. As several other reviewers have said, its very cheap so you can't expect the Hilton! But I had a clean, but old room, comfortable bed and clean basic bathroom. The woman on reception was exceptionally helpful, both with respect to my stay and helping me find my way around Melbourne. I would most certainly return if all I wanted was basic accommodation at an unbeatable price. Place is small and average maintenance done on the apartment. Unit are decent size n the bath room are small. U will find crack wall, spider web along the apartment. However, if u r on budget n can't afford more than here is good enough. Only stayed one night but was happy with the room and amenities. Parking was available so that was good. The bed was comfortable. The location was great for what we needed. I would definitely stay here again. I can't review much, because the information around check in closing at 6.30pm was so hard to find (and not on my confirmation) that I didn't ever get to my room and was surprised that with such an early close for check in, that it wasn't more obvious on the site and that there was no call to ask if I was still coming. The after hours phone number had no answering service and I ended up having to drive two hours back home, only to get at up at 5am the next morning to be able to make it to work - Luckily I live in the state, unlucky that I was trying to save myself from being on the roads exhausted by booking a room I didn't get to use. perfect location very close to Olympic park & short walk to the city or you have the tram & train stop 1 block away on the main road. the price you pay here is the same price you pay at the hostel YHA in the city... so hostel or apartment you decide lol?! It has all the basics that we need. Microwave, kettle, tea, coffee, bathroom amenities, heating, and towels. The staff was great, friendly and helpful. We had the top floor (3rd floor), stairs only no lifts. We didn't have any big luggage so it was not an issue for us. Our window had a bit of a city view which was nice. The apartment is on a lovely street with gorgeous houses nearby. We paid $105 for the apartment and you get what you pay for. Room was basic but clean, safe and lovely receptionist. The place was safe and close to where we needed to be. Not flash but we werent expecting it to be. We booked a family room, was spacious and cozy but just a bit old. If it could undergo some minor renovation or upgrading, it will be excellent! Other than that, not much complaint. The staff is very helpful! Everything is good, staffs are polite and helpful, room are clean and big enough can fit 3 people even though we booked for 2. 7-11, tram station, cafe and library are just at the corner, very convenient. If you are looking for great value, this is it! 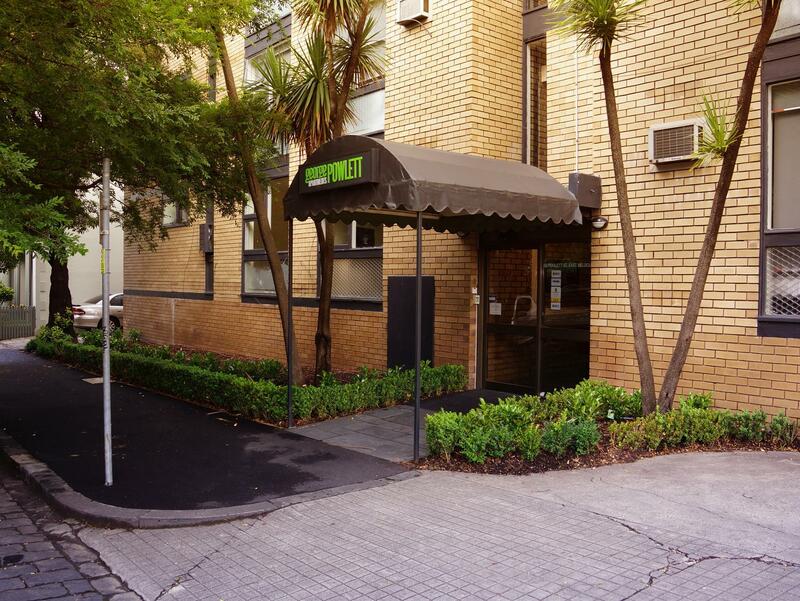 Situated in East Melbourne, these self-contained apartments are small and basic but very clean. If you want pampering in a hotel, go for it! If you want a cheap and comfortable place to sleep and look after yourself, stay here. In the same block, you have a Convenience Store, an excellent Coffee Shop, as well as some good-value restaurants. It is opposite the MCG Park and only a short trip to the City by tram in one direction and a short walk to wonderful Chapel Street, Richmond in the other direction. And, I strongly recommend the walk through the Treasury Gardens which will bring you out at the top end (the Paris end) of Collins Street. I love it! I booked the room based on the reviews. However,I was worried about the condition of bathroom after I read the comments . Most of them said the bathroom was in poor.condition like leaking, dirty tiles & not enough h. I think the shower heads were changed to new ones. The tiles were outdated & not clean. Hair dryers were out of order & full of dust at both of the rooms. No wonder the hotel don't put the photos of bathroom on the website. However, we did not have any problems with water. The room is spacious and basic. It's a LCD TV, a small table with 2 chairs & a small kitchen (but no stove). Tram station is just right in front of the hotel. The hotel's near MCG but a bit far from city. As we only stayed for few days, we rented a car instead of taking public transport, which is expensive. However, parking in city is not easy unless you are willing to pay high fee. The hotel provides free parking when you give a refundable deposit of A$50. It's easy to find a parking along the road. Do not park underground as it's too narrow. We did not face any problem with wifi although some complained about the poor reception. Finally, it's up to your budget whether it's value for money. I think the hotel'd attract more business if they can renovate the bathroom. I booked 2 rooms & requested an early check-in in an email. The staff replied no problem immediately. However, I decided to go sightseeing and changed my plan to late check-in. The staff put our keys under the carpet coz the reception's closed after 18:30. We reached the hotel around 20:00. It happened that we locked one of the rooms while we moved in the baggages and the key's inside the room. We called the hp no. (a contact no. after office hour) and the person-in-charge (or the owner) replied he'd go back in 40 min. Pros : The room is spacious with Flat TV, a small table with 2 chairs, a fridge and a small kitchen, but no stove. Wifi's working ok. Location is near MCG but not city. We rented a car so it's not a problem for us. Cons : I decided to choose the George Powlett coz it got 7.1 on Agoda although some complained poor wifi & small parking. However, I was worried about the bathroom after I read the comments. Normally I'd read comments from different websites before I made the booking. This time I made the decision too fast. I was regretted and checked whether it's possible to cancel the booking even I'd lose exchange rate. Of course it's not successful. I think the hotel did change the shower head. The tiles seemed like good old days but not very clean. The hairdryers were out of order in 2 rooms and full of dust. Now I understand why the hotel does not put up the photos of the bathroom on their website. No room service which I knew it after I read . Do not park underground coz there's a sharp turn when you go out. You can park outside if you pay a refundable deposit of AUD50. However, I think I'd rather pay some more to get a better bathroom.